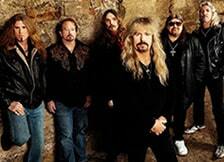 Jacksonville’s Molly Hatchet meld loud hard rock boogie with guitar jam-oriented Southern rock. Formed in 1975, the group’s original lineup featured three guitarists — Dave Hlubek, Steve Holland, and Duane Roland — plus vocalist Danny Joe Brown, bassist Banner Thomas, and drummer Bruce Crump. They recorded a self-titled debut album in 1978, which quickly went platinum; the follow-up, Flirtin’ with Disaster, was even more successful, selling over two million copies. Brown left the group in 1980 after the constant touring became too tiresome; he was replaced by Jimmy Farrar for Beatin’ the Odds, but Farrar’s voice was less immediately identifiable, and Molly Hatchet’s commercial appeal began a slow decline. The band experimented with horns on Take No Prisoners, but Farrar left for a solo career soon afterwards. Brown rejoined the band in 1982, but the ensuing album, No Guts…No Glory, flopped, and guitarist Hlubek insisted on revamping Molly Hatchet’s sound. After The Deed Is Done, a straightforward pop/rock album, the group took some time off in 1985 while its Double Trouble Live album, a collection of some of its best-known songs, was released. Molly Hatchet returned in 1989 without Hlubek for an album of straight, polished AOR, Lightning Strikes Twice. Not even the group’s fan base bought the record, and Molly Hatchet disbanded shortly afterward. They reunited in the mid-’90s as an active touring outfit, releasing Devil’s Canyon, their first record since Lightning Strikes Twice, in 1996. Continuing to recapture the style of their glory days, Silent Reign of Heroes followed in 1998, and Kingdom of XII appeared in early 2001. A slew of live recordings appeared during the next few years, and the band’s studio follow-up, Warriors of the Rainbow Bridge, was released in 2005. Their 13th album, Justice, appeared in 2010.